Daytona wins with three unearned runs in the top of the eighth inn. 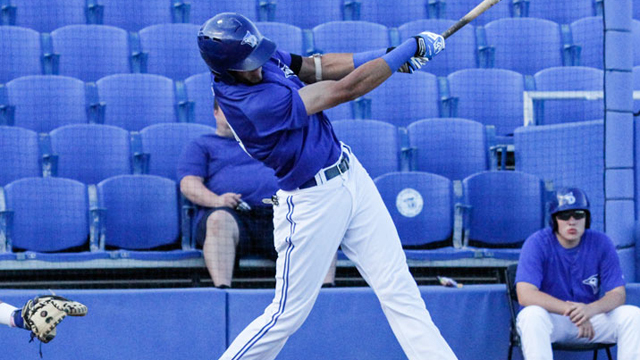 Dunedin, FL - Despite two homers from CF Emilio Guerrero, the Blue Jays fell just short on Tuesday night in a 6-5 loss to the Daytona Cubs at Florida Auto Exchange Stadium. Three unearned runs decided the game for Daytona in the top of the eighth. With the Blue Jays leading 4-3 on a fifth inning homer from LF Dwight Smith, Jr., Dan Vogelbach drew a leadoff walk against LHP Efrain Nieves (L, 3-5). Billy McKinney singled two batters later, and Wes Darvil reached on an error to load the bases with one out. Wilson Contreras pinch ran for Vogelbach, and scored on a passed ball by C Jorge Saez -- his first of the season. Nieves then struck out Rock Shoulders for the second out, but surrendered a two-run single to Marco Hernandez, which gave Daytona a 6-4 lead. Guerrero led off the ninth inning with a homer against Zack Godley (S, 7), and SS Peter Mooney singled to put the tying run on base, but Godley retired the next three men in order to close out the game. Guerrero started the scoring with a three-run homer in the first inning, launching an opposite field blast over the right-field fence. Daytona would slowly chip away at the 3-0 lead with an RBI single from Darvil in the first and a homer from Bijan Rademacher in the fourth, and eventually tied the game with a run-scoring single by Jacob Hannemann in the fifth. RHP Roberto Osuna issued no walks and struck out a season-high seven hitters in 4.1 innings while allowing three runs on five hits. Stephen Perakslis (W, 5-0) did not allow a run in his 2.1 innings despite allowing two hits and issuing three walks. Cubs starter Rob Zastryzny was on the hook for the loss before Daytona's comeback, allowing four runs in five innings. All five of Dunedin's runs came via the long ball. The D-Jays went 1-for-13 with runners in scoring position and left 13 men on base. LHP Matt Boyd will take the hill in Wednesday's rubber match against RHP Juan Paniagua. With the second-place Tampa Yankees playing a twin bill in Clearwater, Daytona's division lead could potentially be dwindled to a half game.